I need some support to identify the ribbons on this ribbon bar. The guy on this picture looks to be a german officer who surved for the ottoman air service. 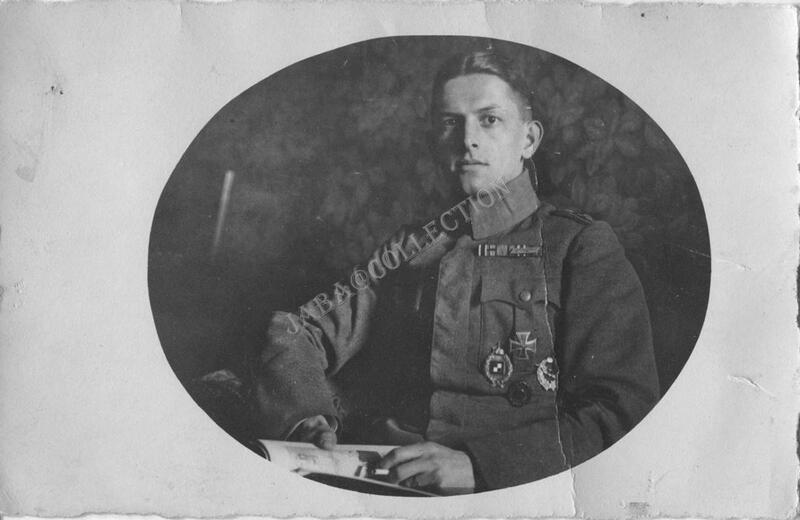 He wear the german observer badge, ottoman aviation badge, iron cross and the wound badge. 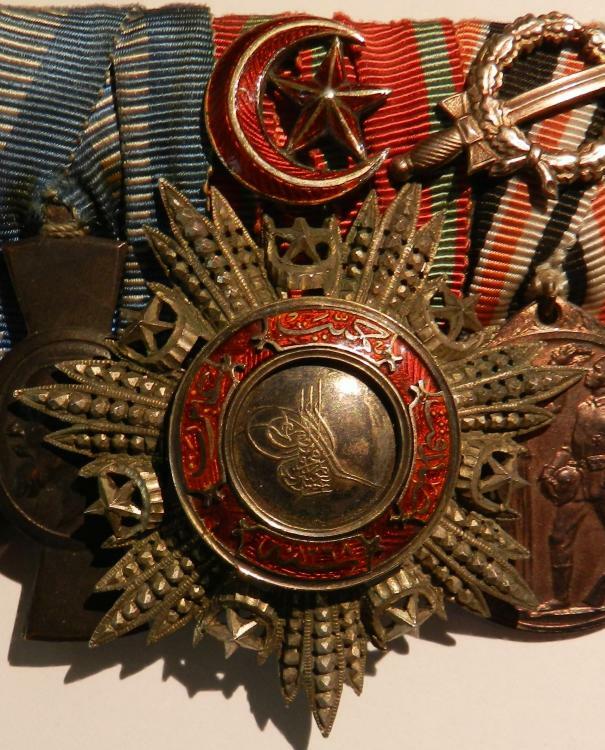 On the right chest the ottoman war medal. So far so good but what does he wear on the bar? can someone identify the clasp on the ribbon for the war medal? The clasp is indeed upside down and looks to be the one for 'Irak'. This group went to a Wilhelm Renk, served from the beginning to the end (I have the paperwork), ending as an Unteroffizier. Enjoy! Löwenkopfsäbel - need help with marking / unit stamp? Happy to help! I wonder if this was a requistioned example, given how highly decorated it is and the monogram - it went from private to state service? Great story and great research - thanks for sharing! 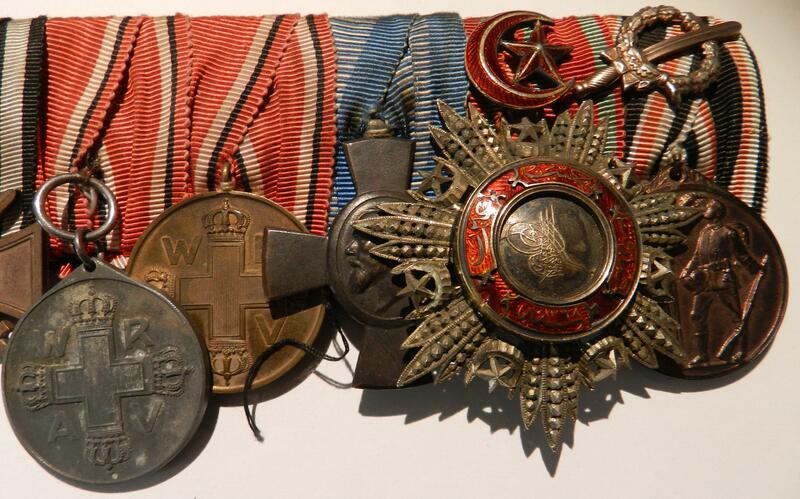 Medal bar to a German medic in Ottoman service? There is no chance to ID that guy without a name. The König Ludwig cross was a mass decoration. What we know is, that this decorated person was a prussian - may be a medic. The bar was made in the mid 1930s. Yes, I am fully aware there is a mistake there... I do KNOW that there should be a silver second class in front of the bronze 3rd class... Read my post... So, what was happened here? 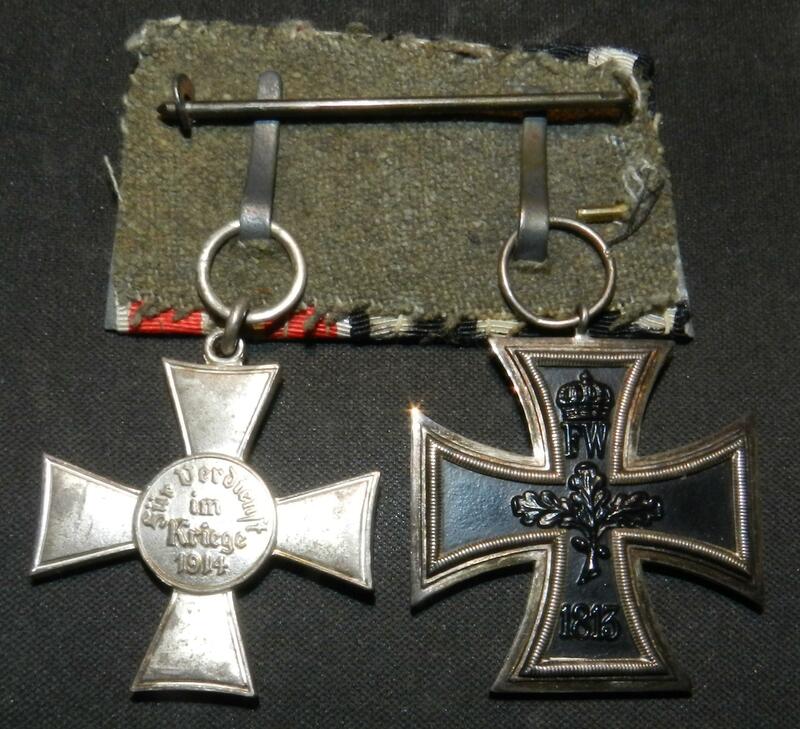 Think on it... A medal bar with two Prussian red cross medals but a zinc one where a silver one shuld be? My take. The silver went lost, but somebody knew what the ribbon was for and so put the zinc one there - note how it hangs lower than the rest. 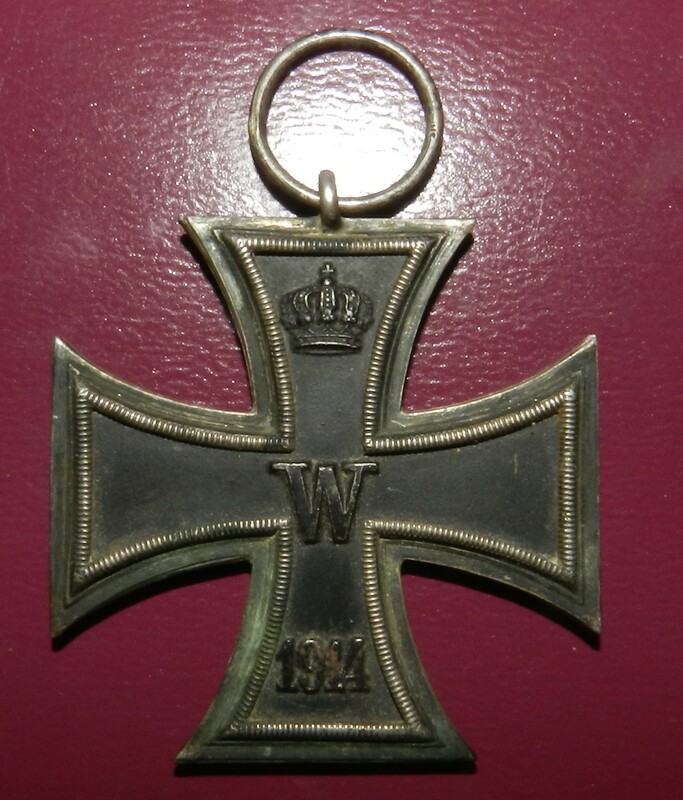 That person who replaced it KNEW it had to be a red cross medal but did know or did not have access to a silver one. I won't change it - piece of history as it is! I don't know how widely the König Ludwig cross was awarded - but wasn't it more a civilian decoration? Either way, the man ths bar belonged to was indeed a Prussian - and not "may be a medic", but I would think "certainly a medic", and an officer medic at that! Yes, of course a 1930's bar - it has a HK on it! I am not a complete dumbo!!! Thanks - pride and joy really of my small collection! I have a selection of German state groups with EK's etc., but this is my only group with an Ottoman award as well. 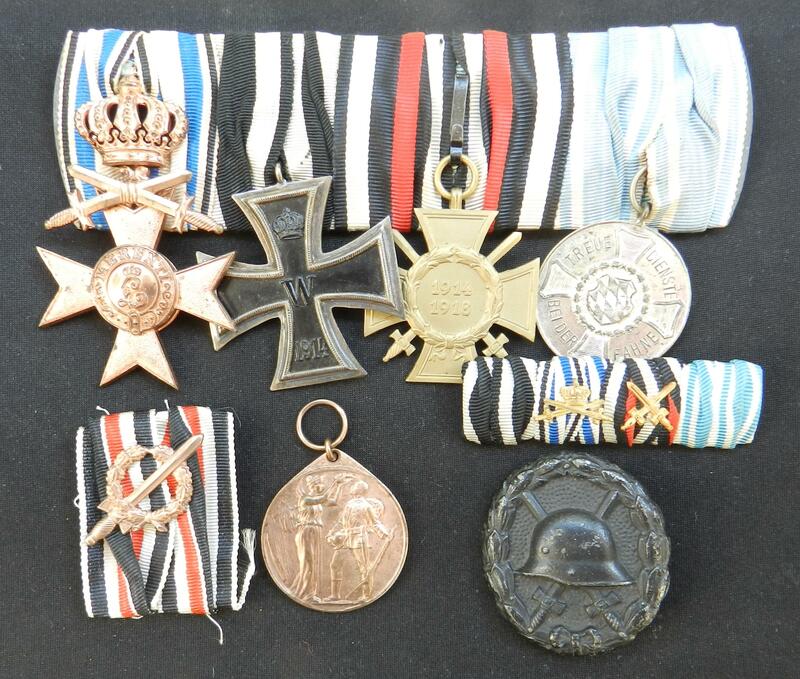 Thanks - came from a reputable dealer in the UK but I am not really a medal collector, I just wanted some good examples of German WW1 medals 'to have and to hold'(!) with my small imperial geraman collection of bits and pieces! 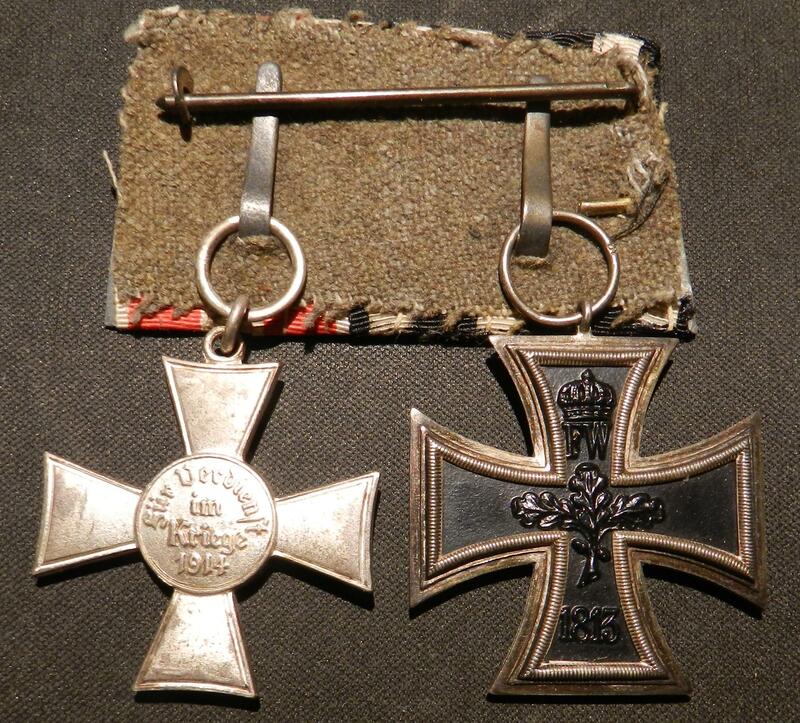 It certainly relates to Prussian service under the Ottoman Empire but with with a few oddities - e.g., why a second Prussian Rotkreuzmedaille in zinc where a second class silver should be? I suspect to replace a silver that was lost... And the back-to-front VdK für Kriegshilfe next to the EK? Well, I have seen that in bars before. But why a Bavarian Ludwig Kreuz (non-magnetic) at the end for a Prussian? 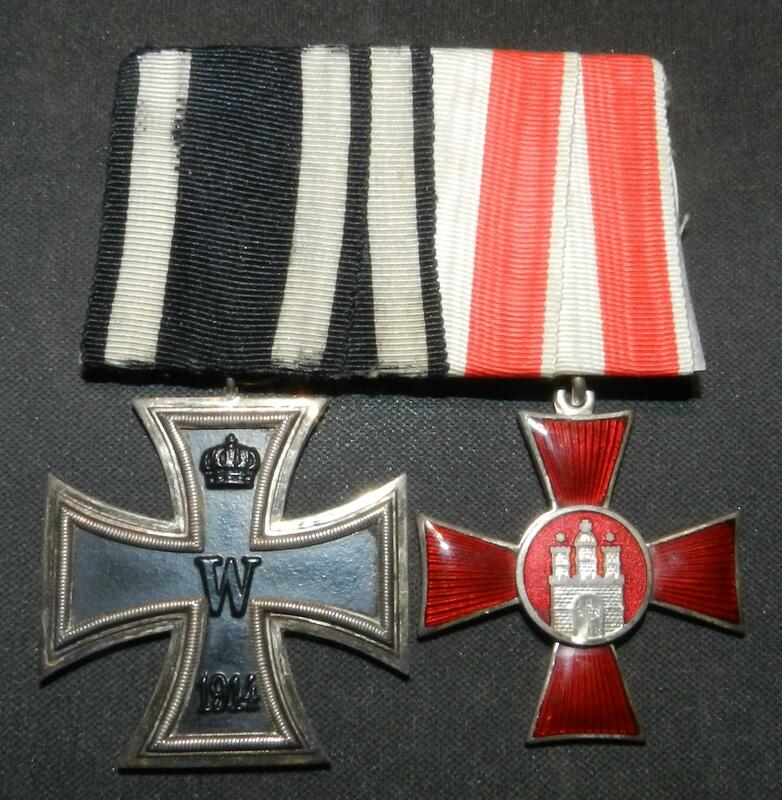 I have no problems with the unofficial veterans Verein medal at the very end as I have seen photographs of guys in the 3R Wehrmacht wearing these alongside their WW1 medals and HKreuz, despite what the 1935 rules said! A 'Combatants' HK with Red Cross medals would certainly seem odd(!) - but is not without parallel! 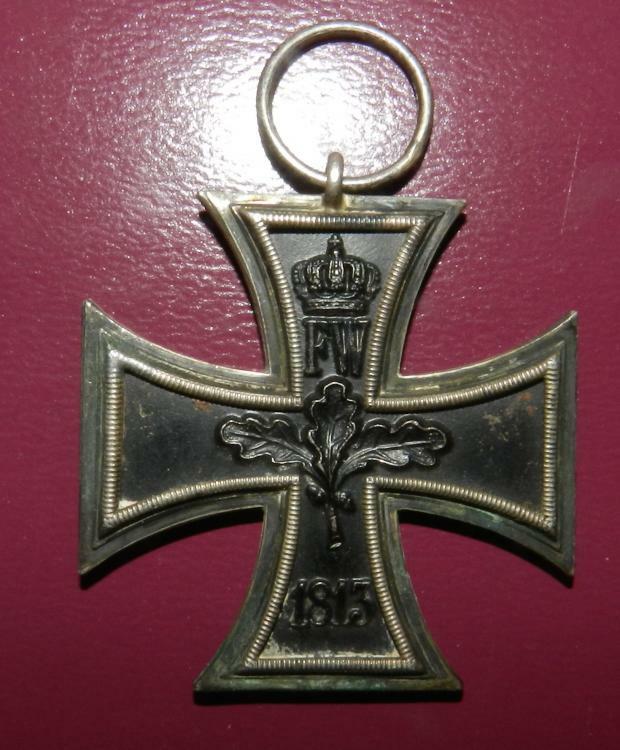 Have a look at this group: https://www.the-saleroom.com/en-gb/auction-catalogues/berliner/catalogue-id-bahg10000/lot-4086fb7c-459c-42dd-8f47-a49d01669c78 It belonged to a Dr.Bernhard Zscech, a German officer who served with the Ottoman army in WW1, and who is listed as a Hekim Binbaşı or "Physician Major" in a Turkish list of German military officers in Turkey in WW1. 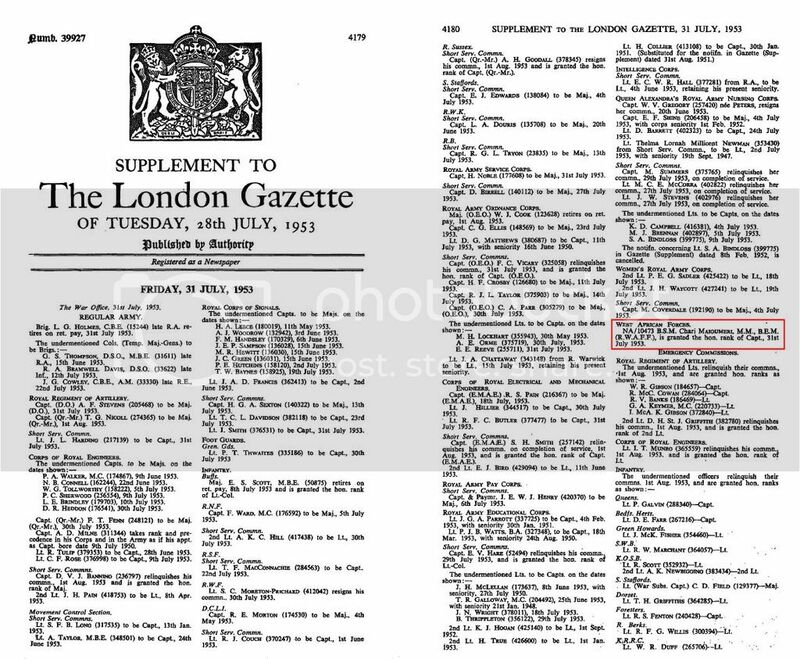 He accumulated, inter alia, an EK I and II; a Prussian Red Cross Medal 3rd Class; a 'Hindenburg Cross' for a Frontkaempfer'; and a row of Ottoman awards - Liakat-Medal, in silver with sabres, Imtiyaz medal in silver with sabres, an "Iron Crescent", or Harp madalya - and a Mecidiye Order 3rd Class. He is listed as serving at the Deniz Asker Hastanesinde or 'Sailors Hospital' and the Taşkışla hastanesi or 'Hospice' in Constantinople. The Ottoman Medjidieh in this group is 5th Class and so I suspect the recipient was a Leutnant - and I do have a candidate in mind.. But I would welcome all and any comments. Oh, and yes, I did wonder if it was a 'marriage' of medals that did not belong to each other - but a marriage getting a zinc Red Cross medal where a silver one should be and everything else in order? Thanks so much Tomasz for that speedy reply! Here is what I have - I am not the best of photographers so in artificial light and in flash. Looks to be an original? Clear Very nice looking bar. 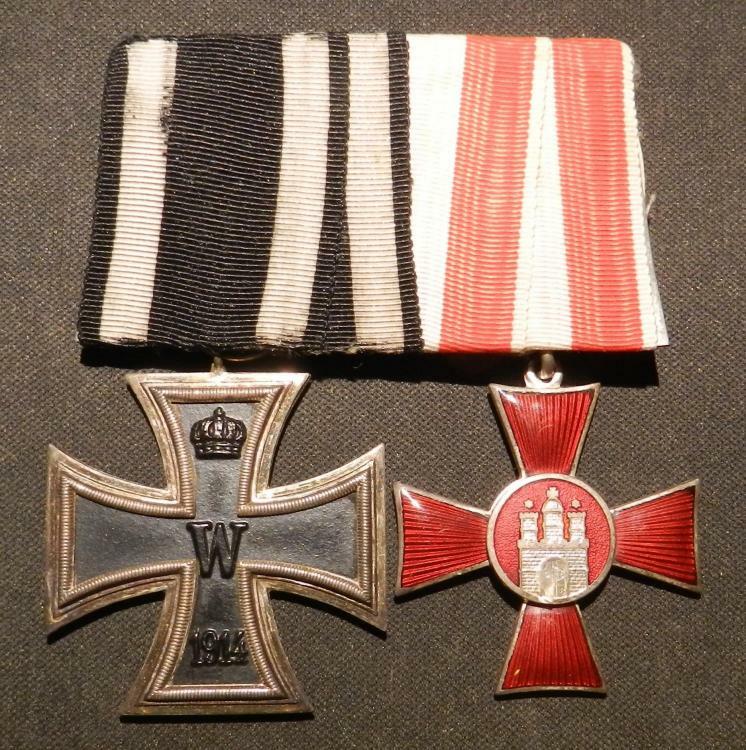 The Hanseatic Hamburg cross is a privately purchased Spangenstück. I have read and re-read these postings and remain confused as to what an official version of one of these looks like! I have a few German medal bars including a paired EK and Hamburg medal, so, which of the above is an official version please! Yeah, the Bavarian LS is odd, but it happened-I have a Bavarians' Hamburg citizenship certificate given to him by the city Senate in 1914 along with his original Luitpold medal certificate. Later he served in RIR76. I got it from Detlev. I bet this chap was a Feldwebel or even a Feldwebel-Lt. So, what is his name? That is some piece! Can we see the photograph of the former owner? Can anyone idenify this maker's mark? Is that a feltt washer at the crossguard? Were these not used on dress bayonets only? No, not copying a pickelhaube, but much more likley to be a copy of a GB Life Guards helmet. Naval non-magnetic EKII - fact or fiction? Thanks for the remarks. I bought them when I was visiting Germany several years ago. I don't remember how much I paid but I think not so much. I also have these two magnetic EKIIs on ribbon bars. Just for starters, let's see the back! A thread in the Commonwealth forum made me think about this man. I was going to create a new thread when I found there was already one about Maigumeri. Yes I saw that site - and one of the photographs at the start page does show some uniformed official with an SA member, and the former seems to have something on his Ehrenkreuz ribbon, possibly crossed swords. But, basically, yes - more 'bling' was required by the owner of my pair! How are these? Do they help in anyway? I'll try and get new photographs of the EK on line later today - when I find my camera! - but yes, a partial stamp for 'WUS' is a good explanation. 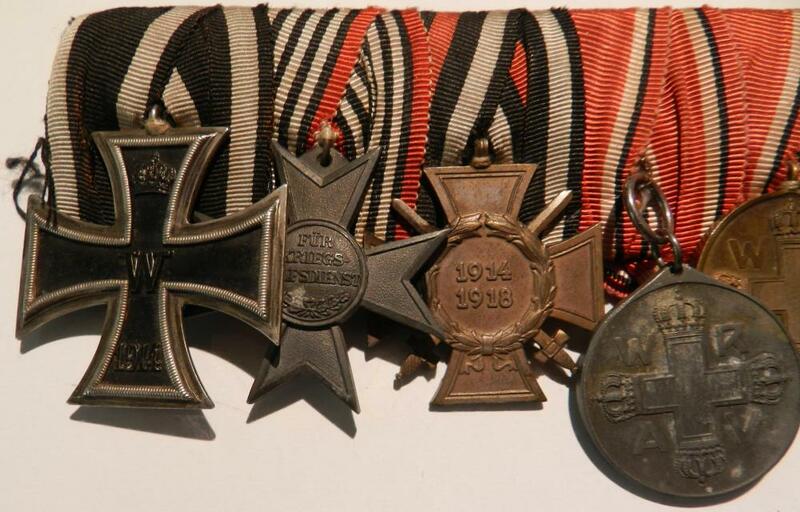 I gather that there were quite a few EK makers and that not all have been conclusively identified, but Joh.Wagner und Sohn of Berlin were noted retailers of medals, etc..
Any thoughts, by the way, on the use of Kyffhäuserbund swords on the Ehrenkreuz ribbon on an Ordnensspange? I have seen other examples like this on the web, in collections and in 'for sale' adverts... 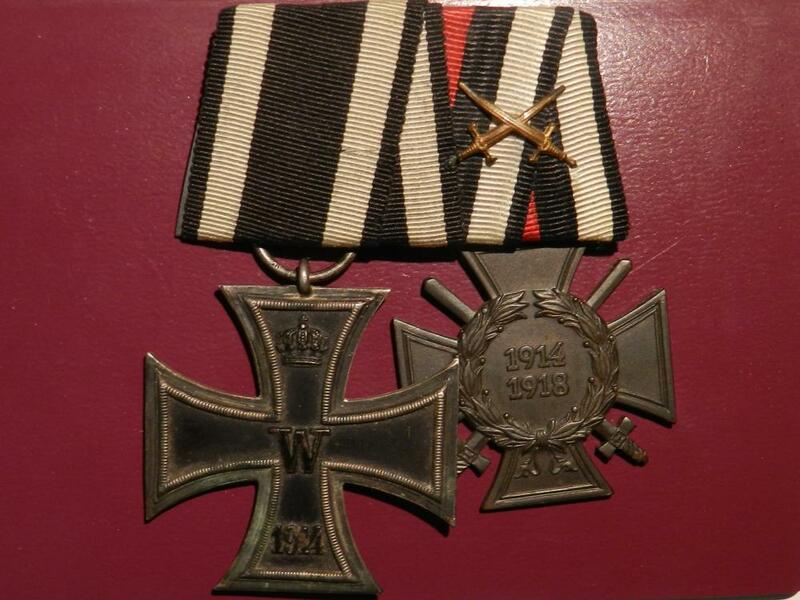 I can understand why a man would have these crossed swords on the ribbon on a Feldspange but why on an Ordensspange when the recipient's category of Ehrenkreuz medal would be clearly visible from the medal itself? Will this one below do to be going on with? I'll try and gets ones of the cross alone tomorrow or at the weekend. Also, any thoughts on the use of the Kyffhäuserbund swords on the Ehrenkreuz ribbon? These were not needed to show the man's combatant status as the medal did that. 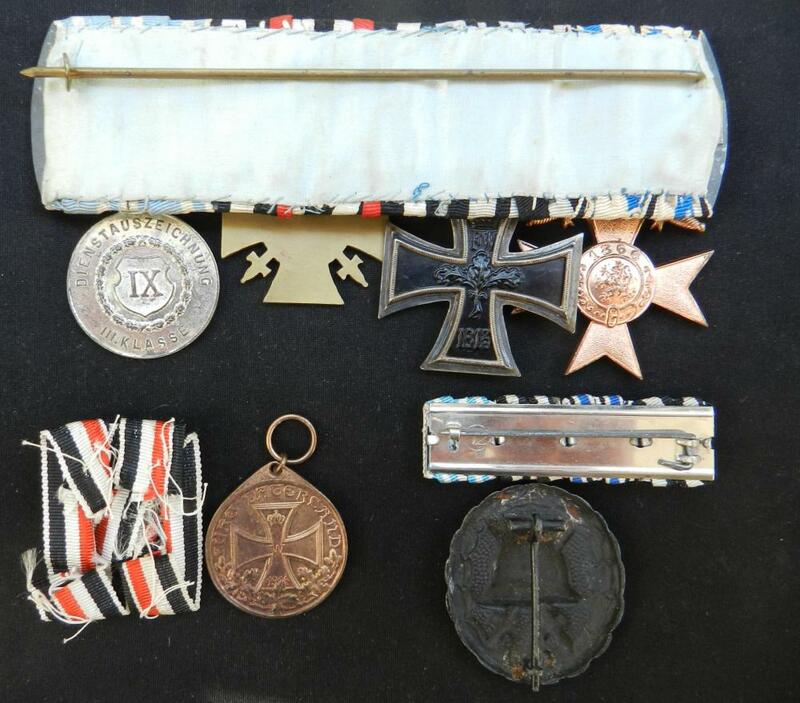 As the medals are easily detachable from the ribbon bar, I did wonder if they were for when the ribbon bar was worn by itself to show the recipient's status as a Frontkampfer recipient of the Ehrenkreuz. I have seen other examples like this.